Cheese is one of the most favorite and popular foods which is a part of daily diet of overwhelming majority of modern families throughout the world. For the last decade, cheese consumption in the US increased by almost 22%. This dairy product is a very common ingredient of may dishes, the one which makes those dishes delicious. However, many people are trying to avoid eating lots of cheese as it is reported to have high content of saturated fat and cause cholesterol problems or other unwanted health conditions. At the same time, it is impossible to claim that moderate cheese consumption does not lead to any good for our health. 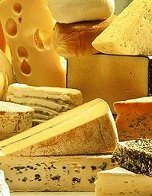 When talking about health benefits of cheese, it is necessary to mention the role this product plays for effective dental care and bone health. Rich in such elements as nutrients as calcium, phosphorus, zinc, vitamins B, cheese assists in bone formation and tooth enamel protection. Regular consumption of cheese in moderate doses can help to prevent such serious health problem as osteoporosis which affect a lot of modern women above 50. Other health benefits of cheese include reducing risk factors for hypertension and heart disease, strengthening liver, stimulating blood formation amd nutrient absorption, and others. Recently, scientists found out that regular consumption of cheese and dairy products in moderate amounts can assist very effectively in weight management. A group of researchers leaded by Wendy Chan, a specialist at Curtin University of Technology, Australia, found out that combining regular cheese consumption with low fat diet can increase the effectiveness of any weight loss program. After the experiments that lasted for several months, those participants who were consuming cheese on a regular basis experienced improvements in blood pressure and the function of their cardio-vascular system. These findings confirmed the results of researches of Michael Zemel, a nutritionist and medicine specialist in the University of Tennessee. His experiments took place in 2004, and Zemel also reported about positive effects of cheese consumption on weight reducing efforts. Zemel recommends consuming about 30 g of cheese on a daily basis, combining it with a balanced low fat diet. In addition to speeding weight loss, the nutritionist also point on other benefits of regular cheese consumption, which include normalizing blood pressure and reducing the amount of tummy fat. Finally, it can help improve metabolism and lower the risks of sleep disorders. This entry was posted 9 years, 5 months ago.